For centuries, Dharma students have traditionally studied Nagarjuna’s Letter to a Friend, for it provides a concise and thorough introduction to the entire Buddhist path practice. 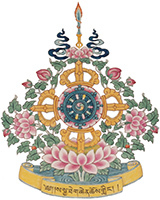 By examining the Four Noble Truths and the Six Perfections, Nagarjuna describes logically and poetically the internal patterns of experience which leads a person to Buddhahood. Please join Lama Kelsang for this weekly Study intensive. This course is open to all levels of practitioner. Lama Kelsang only asks that students make a firm commitment to attending class regularly.